Students wash a dog at the annual event. BLACKSBURG, Va., Oct. 13, 2008 – Veterinary students enrolled in the Virginia-Maryland Regional College of Veterinary Medicine will present a community dog wash on Saturday, Oct. 18 from 8 a.m. to 3 p.m. on Virginia Tech's Blacksburg campus. The community dog wash event will be held at the rear of the veterinary college complex. Signs on Southgate Drive and Duck Pond Drive will help guide dog wash participants to the event. Presented semi-annually by doctor of veterinary medicine students enrolled in the college, the dog wash is always a popular community event. The cost of a dog wash is $10 and for an additional $5 customers can have their dogs' nails trimmed and ears cleaned. Animals will be washed on a first-come, first-served basis and no appointments are necessary. Dogs will be washed while owners wait. Dogs must be on a leash, and be at least five months old with current vaccinations. 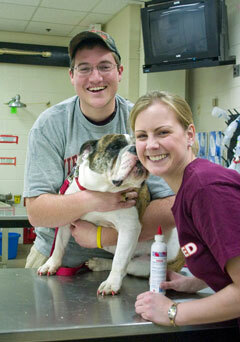 The dog wash is sponsored by the Student Chapter of the American Veterinary Medical Association (SCAVMA), a professional organization for doctor of veterinary medicine students, the Class of 2011 and the Class of 2012. For more information, e-mail Rachael Hall or Rennie Waldron.